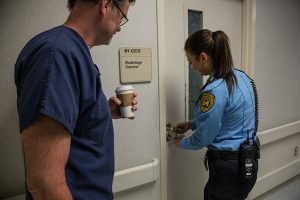 The Division of Public Safety and Security (DPSS) manages identification cards and keys for the Michigan Medicine health care complexes. Other identification card, key and lock services—including MCards, lock installations or repairs, and card readers for resident halls—are managed by the Treasurer’s Office, Facilities & Operations or University Housing, respectively. For more information, including links and contact information for the above listed offices, please choose a category below. Note: Links will take you to external sites. Michigan Medicine Security’s Key and ID Office issues new and replacement employee identification badges and keys. The required forms can be found below. All forms must be signed and completed by a department authorizer before keys or badges will be issued. Note: There is a $20 fee to replace damaged or lost IDs. 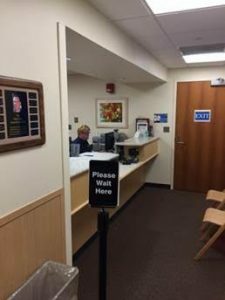 If you’re faculty or staff at Michigan Medicine or a student at the Medical School, you will need to obtain, renew or replace your MCard at the Michigan Medicine Key and ID Office. To learn more about MCards for all other faculty, staff and students on the University of Michigan campus, please visit the Treasurer’s Office. Note: If your MCard is stolen, please report the incident to DPSS by calling (734) 763-1131. You also may report a crime online. Installation and repair of door handles, knobs, levers, etc. Rekeying of doors, file cabinets, desks, etc. *If lost keys are not claimed within three months, they will be disposed. University Housing utilizes electronic locksets (card readers) for exterior residence hall doors, resident rooms, community bathrooms and other interior corridors in residence hall buildings. For more information, or to request a special key for religiously observant students, please visit University Housing. If you are locked out of your apartment, you may borrow a key at the Northwood Community Center during normal business hours. For after-hours lock-out assistance, please contact DPSS at (734) 763-1131.